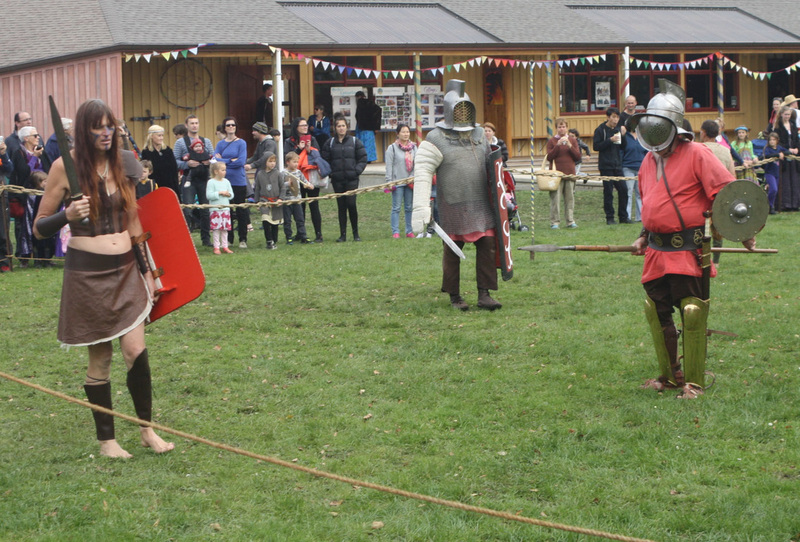 Imperium-Romana attended the Medieval Carnival fundraiser for the Waldorf School. 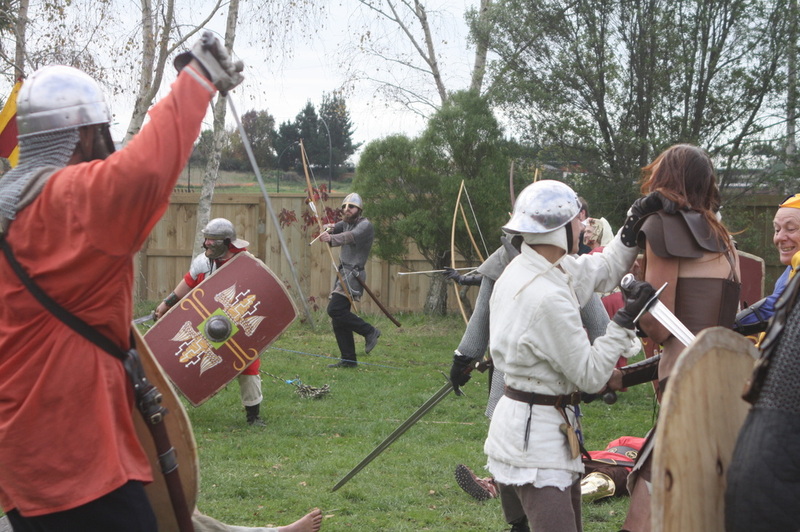 Our Legio VI Ferrata once again teamed up with the V cohort of the X Legion (Darryl's boys from New Plymouth). 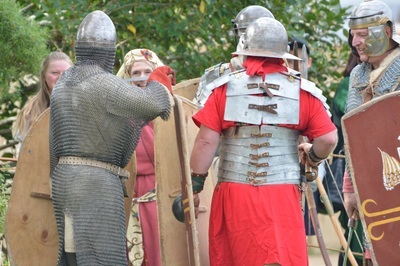 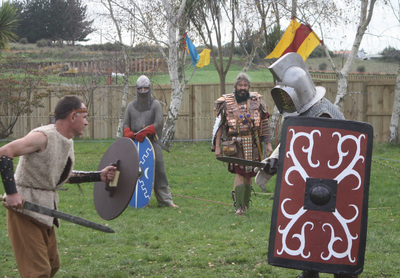 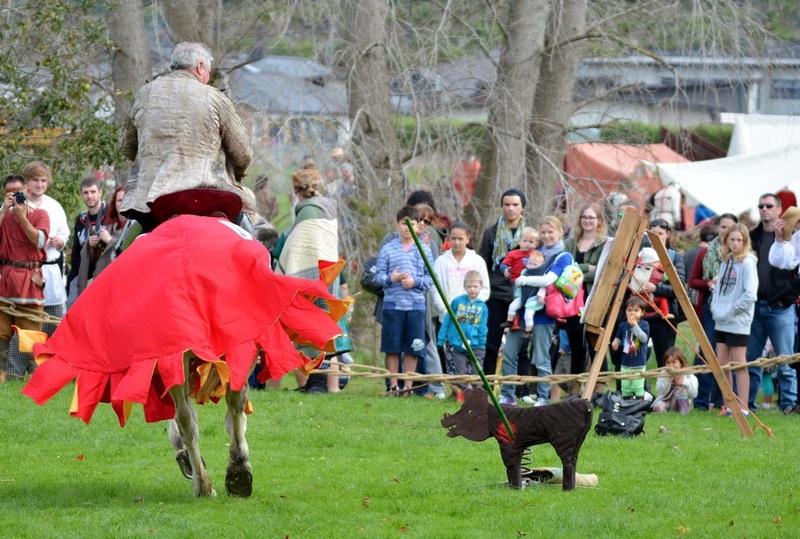 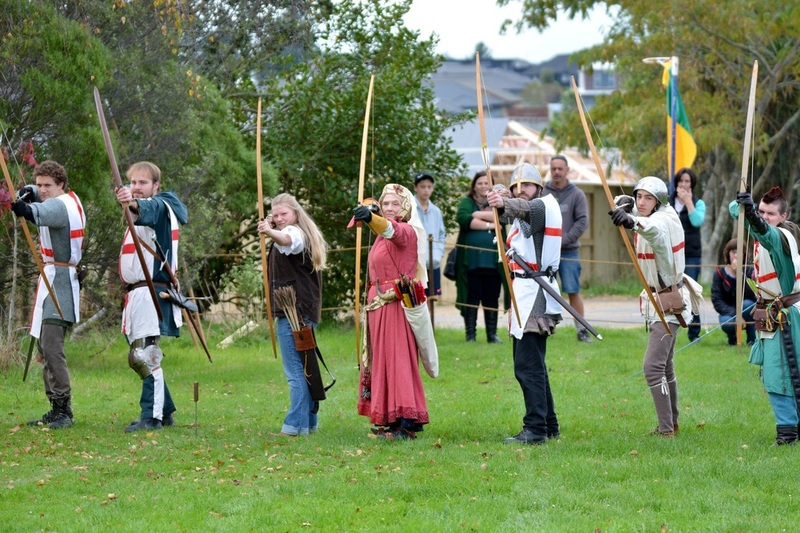 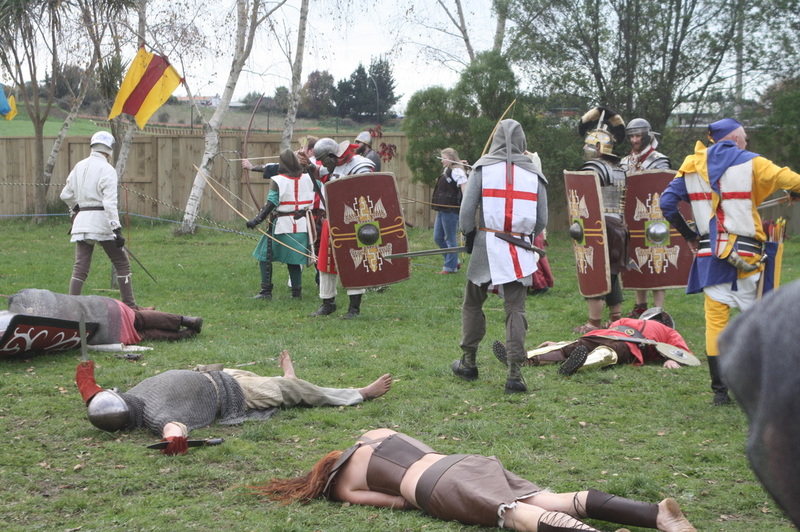 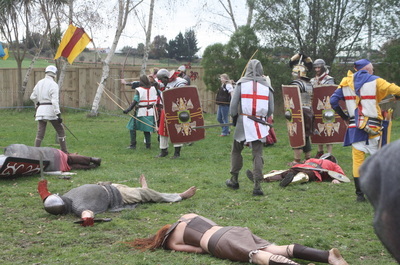 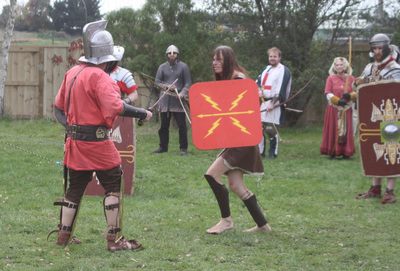 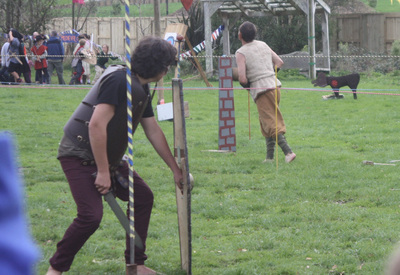 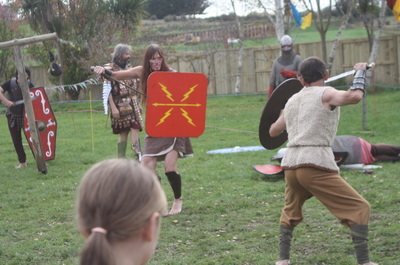 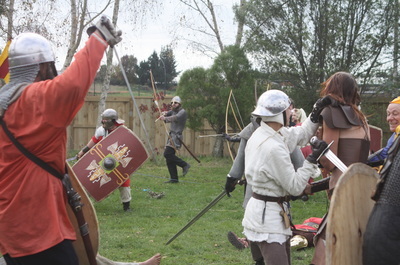 Other re-enactment groups taking part included the Sable Harts, SCA and the Guild of the Hawk. 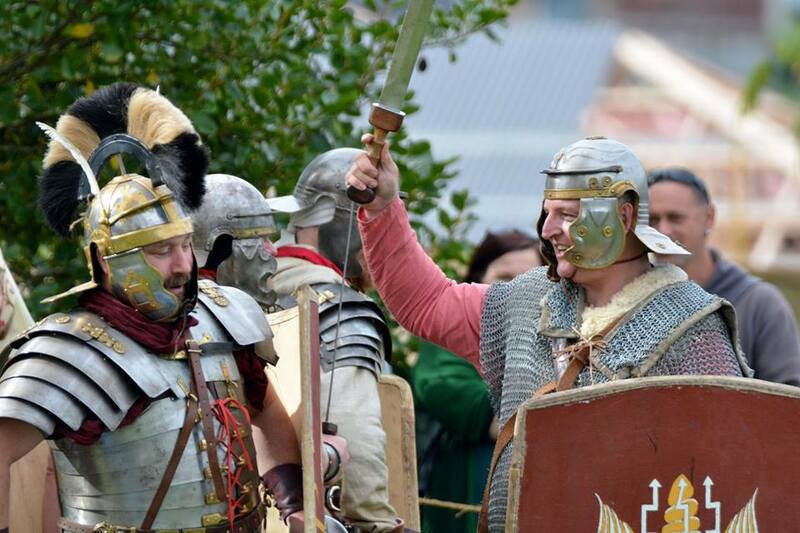 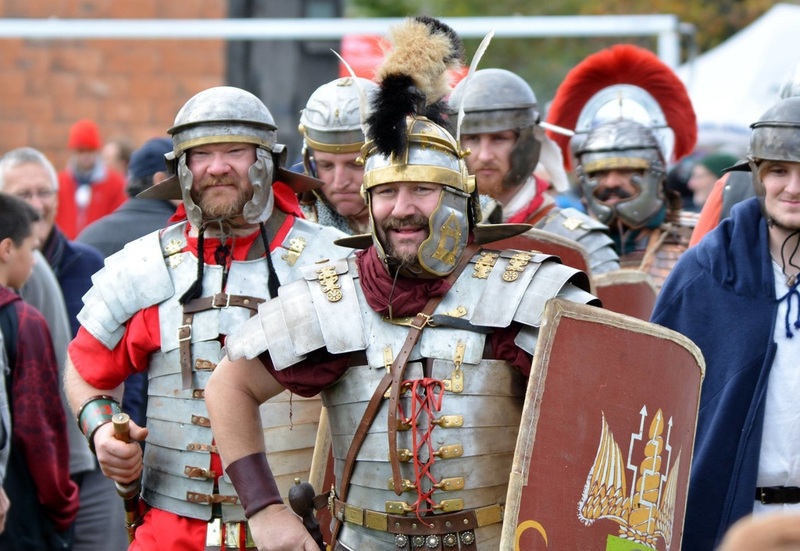 Our impressive Roman display included a charge at the crowd with drawn swords and legionaries together advancing in vallum formation of lapped shields against withering archery fire. After lunch the NZ Gladiator School put on a show for the kids. 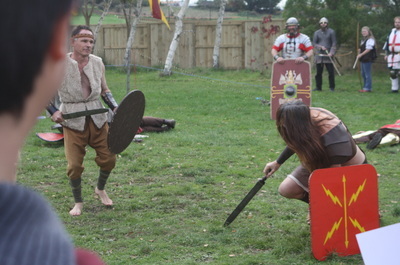 In the first bout Decebalus the Dacian (Dave) fought Iduna the Gladiatrix (Petra). 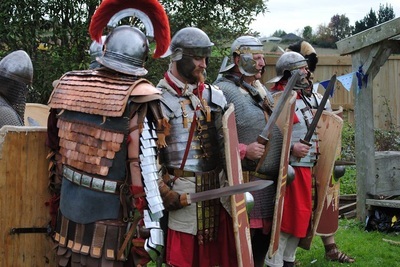 The V cohort of Romans surrounded the fight areas on guard duty. 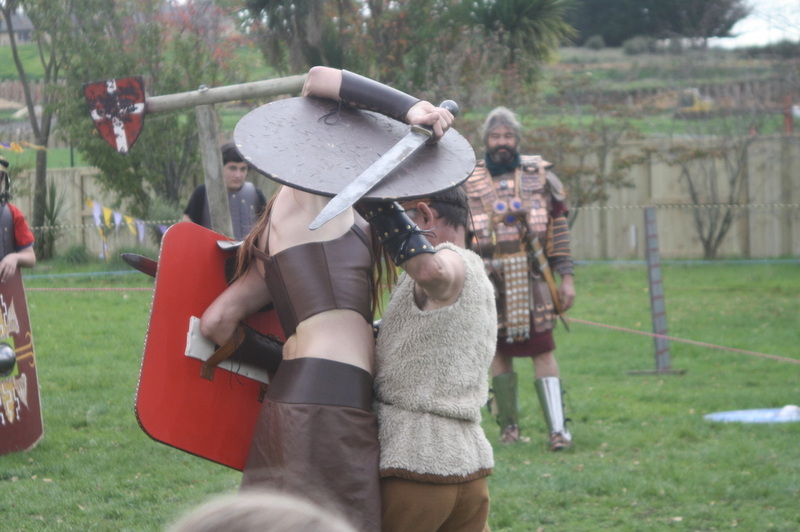 Decebalus fought as a Hoplomachus in Greek-style with spear and small round hoplon shield, but was killed by a sword through the side. "Shall we move the dead body?" 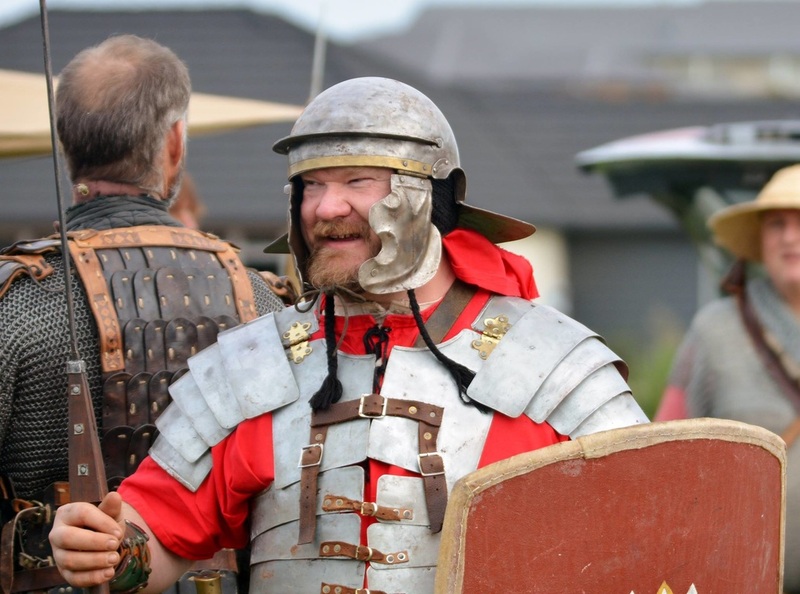 asked one legionary. "No, leave the meat," replied Optio Darryl Thomas. 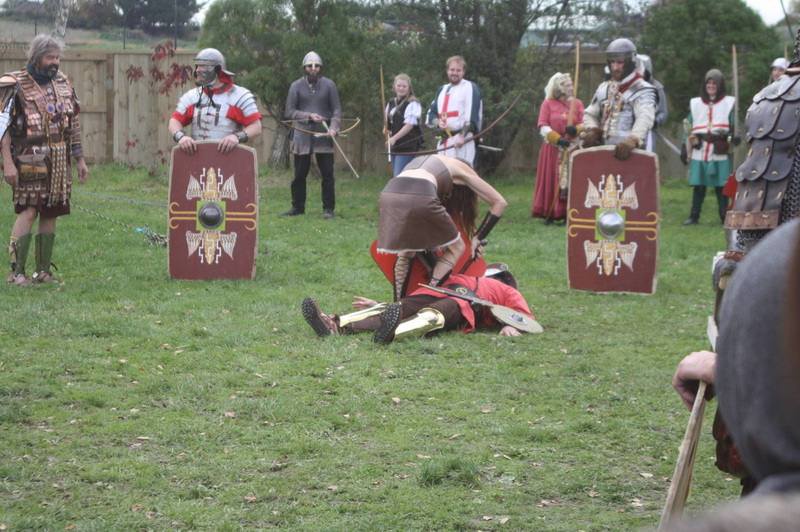 Then Lucius the Damned (Victor) fought as a giant Murmillo against Jorkellus (Chris). 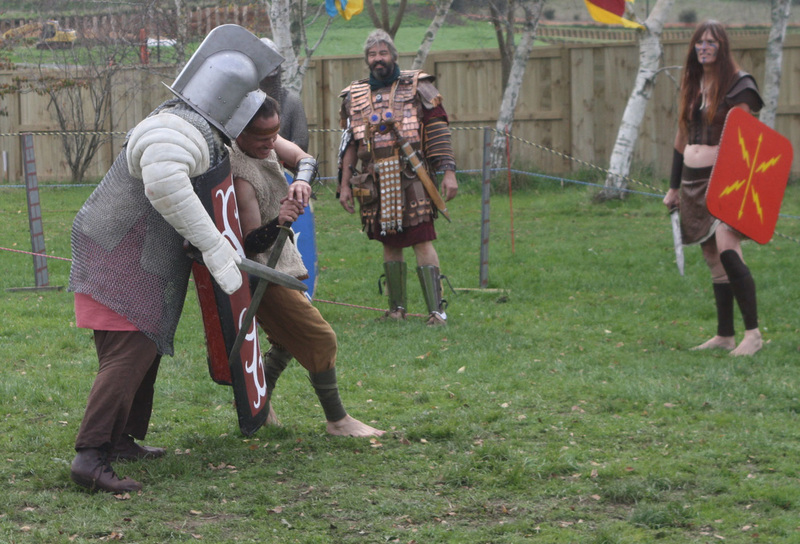 The bout ended when Jorkellus ran up Lucius' shield and leaped over to kill him from behind. 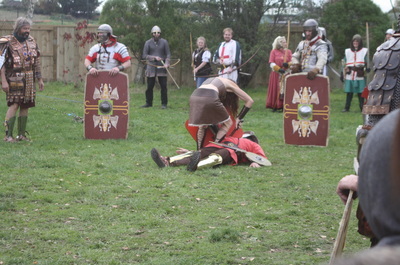 Daring to defy Rome, Jorkellus ran for his life, and was shot down by the deadly archers of the Sable Harts. 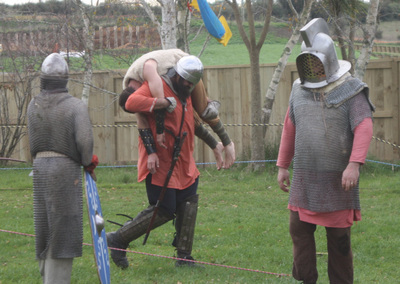 One of the auxiliaries shouldered his dead body and sang out, "Meat's back on the menu, boys!" 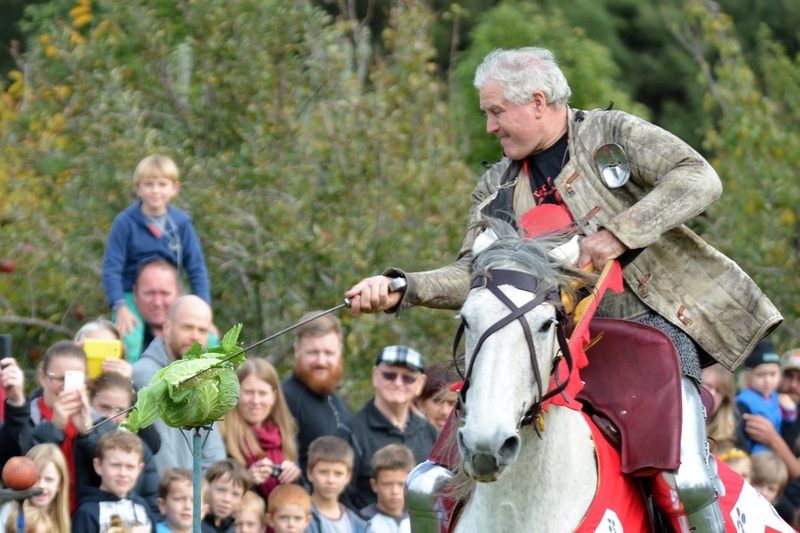 ​Although it was a Medieval Faire, the Bogans tv star Fro says that he actually stayed with the Romans because, he confessed, they were the best organised and could provide him with a nice suitable changing tent. 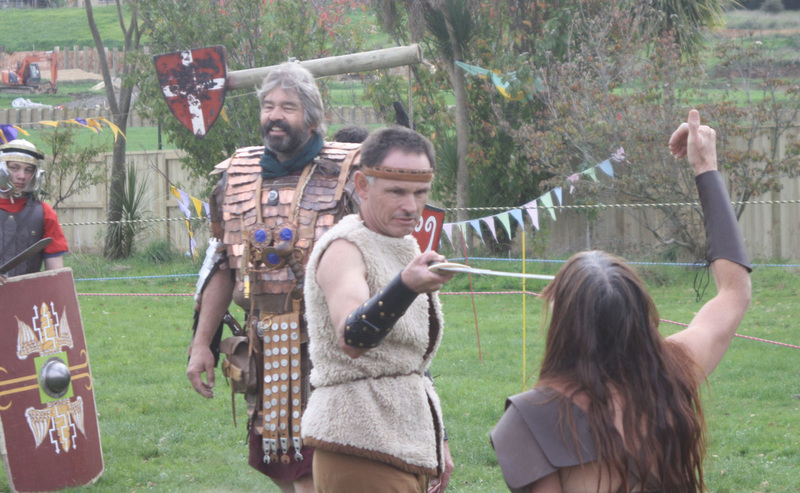 Bogans tv star Fro interviews Dave Layzell, aka Decebalus the Dacian (right). Dave drew his sword, and Fro asked, "What happens now?" 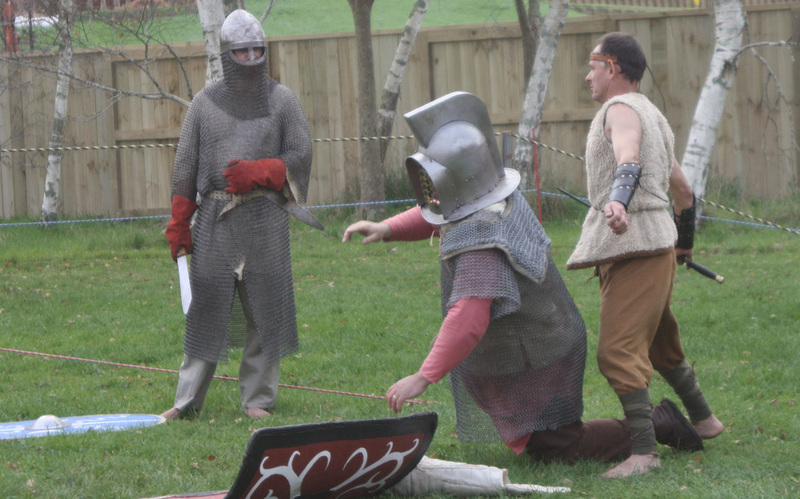 ​Dave replied, "A cut to the shoulder, because I don't like stabbing people in the face." Dave elaborated further by demonstrating a range of cuts to the body, while describing the maneuvers, "Stab! 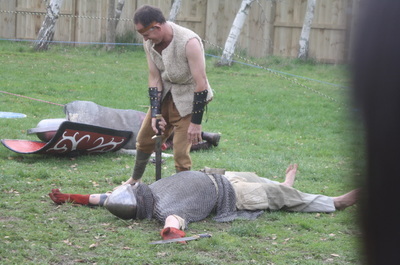 Stab! Stab!" Fro steps back to a safer distance.